'Aigantighe' is the name of the property, meaning 'welcome to our home' in Gaelic, and this applies to you. Landscaped in a traditional New Zealand manner, this comfortable practical family home has been much loved and used, as well as being a small wedding venue. The open plan design living area has both a dining room and lounge opening off. The bedroom wing, besides the four bedrooms sleeping six, has a bathroom, two separate toilets and a shower room/laundry. The downstairs bedroom has an ensuite with shower and toilet. This spacious house was built for the sun and the views, surrounded by and overlooking the native bush to the lake. From the sunny living areas sliding doors open onto outdoor living and BBQ areas, lawn or several quiet decks. No other house overlooks the gardens. A hot tub (in season), is found outside from the bathroom. The driveway winds 100 metres through the bush to emerge at the double garaging under the house. An internal staircase gives access to the main house. On the far side of the garages is a children's playhouse on poles with swings and sandpit. All the attractions that bring visitors to Taupo are well known, but from here a formed bush track leads down towards the safe sandy beach of Acacia Bay. Bird song fills the air at dawn and tui, bellbird, grey warbler and fantail abound. Just down the hill are public tennis courts, playground, restaurant, store and beach; in the other direction the iconic L'Arte cafe. Taupo town is a mere 5 minutes away. The kitchen garden with its seasonal produce, the orchard apples, nashi, plums and grapes, as well as currants and raspberries, are there to be enjoyed. Eggs can be collected from the hens and the affectionate resident cat spoiled. Honey gathered from the hives in the orchard awaits your pleasure in the kitchen. It is a step back in time to when home was a place of contentment. Relax in any number of little private nooks in the sun or shade, and enjoy! House available all year, with 2 night minimum stay if self catering. A FULL catered and hosted HOMESTAY experience is available on request. House and garden location and design make it an ideal venue for small functions, like awedding, family reunion or special purpose retreat. There is a charge for garden preparation. An additional, but refundable $75 bond (also covering small breakages) applies, requiring the property to be left in a clean and tidy condition. Seamless indoor/outdoor flow to gardens, BBQ area or relaxing decks. 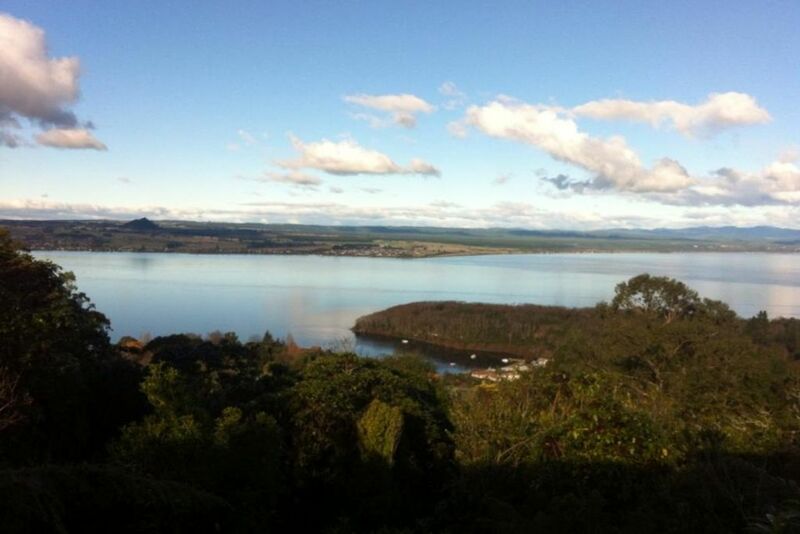 Expansive, uninterrupted views across Acacia and Jerusalem Bays and Lake Taupo to the Kaimanawa Ranges. Geoff was great to deal with. He was very accommodating to our needs. We loved all the different out door areas and the two living spaces. Thank for letting use use the fresh hen eggs and delicious produce from your garden. We had a lovely holiday and would recommend the property to all. Really glad you enjoyed your time here. Thank you! It is all about environment and that old location, location, location. So pleased to be able to share all this special place has to offer. Perfect spot if you like to socialise in a private piece of paradise. Perfect spot if you like to socialise in a private piece of paradise. Lots of areas to explore, inside and outside. Geoff obviously is environmentally conscious, recycling, gardening and composting. Amazing gardens, we loved our stay there, only complaint was it was too short. We enjoyed our stay at the residence and the garden is absolutely stunning! Views are breathtaking. We enjoyed our stay at the residence and the garden is absolutely stunning! Views are breathtaking. Panda is a great companion also. Will definitely visit again. Taupo is a centrally located lakeside city of 23,000. At the centre of the volcanic plateau, there are both geothermal activity and geothermal power stations. Major river rapids and falls make for great sight seeing also. The town offers extensive tourist activities, often lake or river based from trout fishing to kayaking and paddleboarding, and in winter, daily shuttles go to the Ski field (late June until November). The worlf famous Tongariro Alpine Crossing is also an excellent summer walk of 19km.